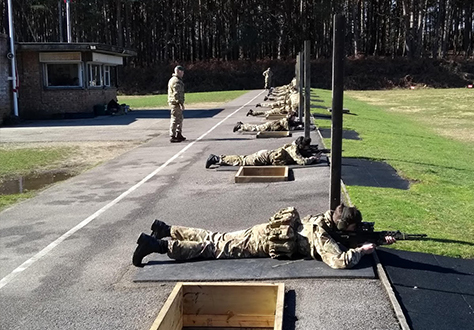 Over Activities Weekend, the Army and Royal Marine sections of the Combined Cadet Force (CCF) travelled to Aldershot Training Area and Pirbright Ranges for a package of field training and live firing. The field training was delivered mainly by selected senior cadets from the Fifth Form (Year 11) and Specialists (Year 12 and 13). These senior pupils demonstrated superb instructional and leadership qualities. The programme included patrol skills, command tasks, a sniper stalk and undertaking a full service rifle classification shoot. All cadets did extremely well over the weekend, achieving the standards required to fulfil their field-craft syllabus qualification. Performances were especially good on the Sunday ranges, with 84% of the boys achieving either a pass, 1st class, or marksman qualification 7 cadets achieved the coveted highest possible score of 70/70. The sections now look forward to next term with a full programme of events, including competing in the 11 Brigade Military Skills Competition, a Parachuting Course at Netheravon and Annual Camps at Crowborough and Lympstone. We offer our congratulations to all pupils involved.